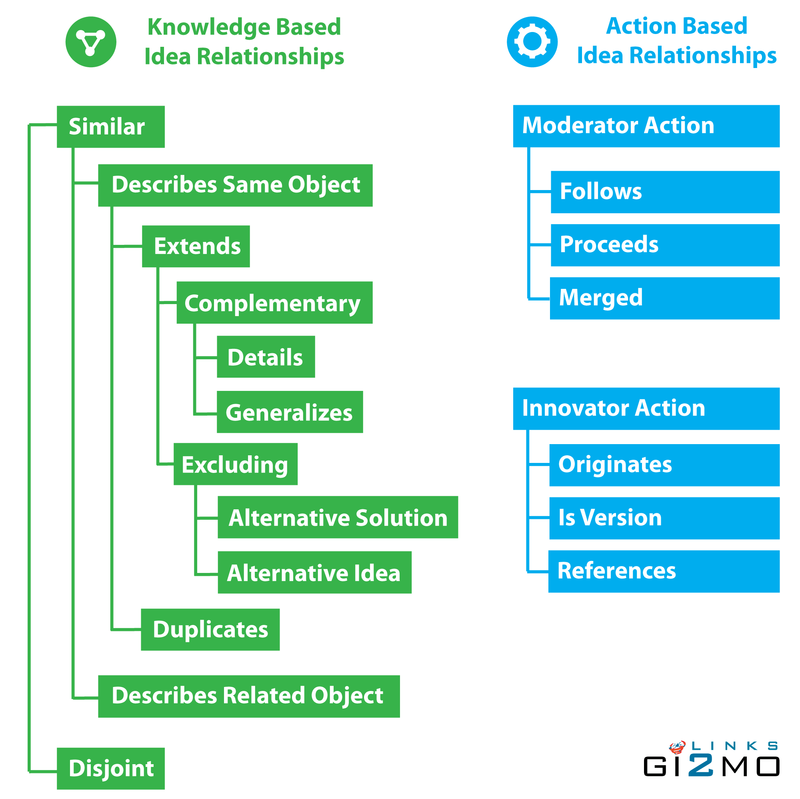 Analysis of information relationships has been the topic of many studies in knowledge management systems but is still unexplored in terms of Idea Management applications. 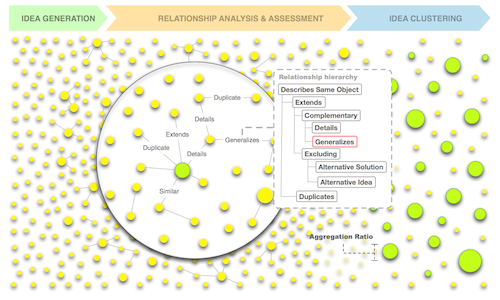 The annotation of relationships can lead to new solutions for: information clustering, improve data browsing, create new data navigation methodologies, create new visualisations that aid information analysis etc. In the following page we take a closer look at the relationships that can be established between ideas in a single Idea Management System instance, we discuss a hierarchy of idea relationships in an Idea Management System and outline one of its possible uses: idea clustering. One of the problems of Idea Management Systems is the huge amount of intersections between ideas gathered over months or years. As time passes, it is too time consuming to browse the entire idea database so new users submit ideas that propose innovations already discussed by others before. The current solution to this problem is detection of similar ideas via frequent keyword search and allowing users to tag ideas as duplicates of other. In Gi2MO Project, we leave this crowdsourcing annotation methodology untouched but we notice the variety of relationship types between ideas is more complex than the currently detected duplicates. In particular, we analysed a number of datasets and as a result we propose Gi2MO Links: a set of new relationships between ideas and organisation of those relationships in a hierarchy that allows to cluster and filter ideas in a variety of ways. Idea clustering based on an extended relationship hierarchy. In the paragraphs below we describe the Gi2MO Links hierarchy, explain the terms, and point to how it can be used in conjunction with Gi2MO IdeaStream software. During our experiments we observed To see how well the hierarchy allows to collect 76% more relationships and using various idea similarity measures and simple reasoning we were able to aggregate 95% more content than just using duplicate detection. For details of our study see a related publication on Gi2MO Links. The first category gathers relationships based on idea scope intersection. The aforementioned duplicate is a special case of this scenario. In contrast, the second category takes into account information flow and organisation of ideas in a workflow relative to idea implementation requirements and goals of the organisation. While those ideas can be labeled as similar due to discussing IdeaStream, due to moderation activities the organiser of idea competition can decide that idea B should follow idea A implementation since technically idea B would be easier to implement after idea A is present. The full hierarchy contains a number of relationship under each category, as presented in Table below. As part of the Gi2MO Project, we have published a number of software prototypes but also a more mature solutions – open-source Idea Management Systems called Gi2MO IdeaStream. In relation to this software platform it is possible to integrate the notion of Gi2MO Links relationship hierarchy and start using it for your own production environment or experiments. Gi2MO IdeaStream has been supplied with a module called IdeaStream Similarity. This module allows to configure a variety of relationships and prompt users to annotate their own ideas or other ideas with the relationships. Furthermore, IdeaStream Similarity delivers a number of additional features like: relationship management, similarity algorithm configuration. For details see the app page for the Similarity module. Aside of deliver a tool that allow the annotation of ideas with the new hierarchy, Gi2MO Links has been integrated into the Gi2MO Ontology in version v0.6. As a result, this allows to export relationship metadata and process it with other Gi2MO Project tools, for example Idea Browser – for relationship visualisation.